Wondering how to keep the kids happy – and occupied – during the long December break? Ster-Kinekor has just the answer for you with the launch of its summer holiday camp, the Ster-Kinekor “Holly-Day-Care”! With four delightful titles releasing during December that promise to keep the kids entertained throughout the summer holidays, youngsters of all ages will be spoilt for choice on the big screen. 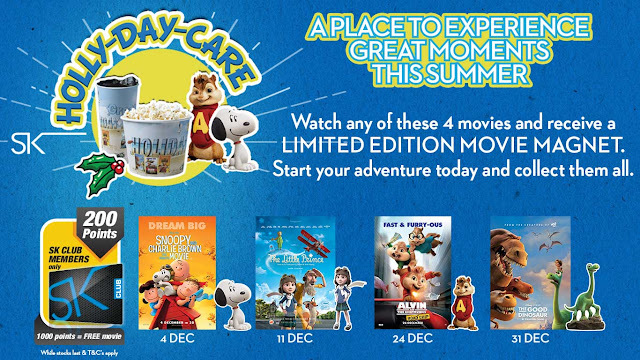 The best part is that with each “Holly-Day-Care” movie watched, the kids will receive a special, limited edition movie magnet of one of their favourite characters from the four films: Snoopy & Charlie Brown: The Peanuts Movie (released on 04 December); The Little Prince (releases on 11 December); Alvin and The Chipmunks: The Road Chip (releases on 24 December) and Pixar’s The Good Dinosaur (releases on 31 December). Ster-Kinekor is anticipating a great response to these films, so be sure to visit your favourite cinema on opening weekend to collect your limited edition magnet (while stocks last). The magnets will be distributed on a first come, first served basis, so kids should get there early to avoid disappointment! SK Club members who book tickets for any of the four films will also enjoy added benefits during the “Holly-Day-Care” campaign – each of the four listed titles will earn them 200 points per movie. With the purchase of a special edition ‘Festive Sharing Combo’ added to the mix, club members can easily notch up the 1000 points that qualify them for a free movie ticket. An extra holiday treat is in store for the whole family, as all four films will be released in Ster-Kinekor’s luxurious Cine Prestige cinemas country wide – the perfect cinema experience to enjoy together. Good news for Joburg movie lovers is that two Cine Prestige cinemas have just opened at the brand new Ster-Kinekor cinema complex at Eastgate – just in time for all the big-screen holiday fun. The first of the “Holly-Day-Care” titles is a firm family favourite – the classic Peanuts movie. Snoopy & Charlie Brown: The Peanuts Movie released in Ster-Kinekor Cine Prestige and 3D cinemas countrywide on Friday 04 December. The film follows Snoopy as he embarks on his greatest mission yet. In this animated adventure film, Snoopy and his team take to the skies to pursue their arch-nemesis, while his best friend, Charlie Brown, begins his own epic quest back home. Ster-Kinekor serves up an enchanting dose of fantasy with the release of the classic story, The Little Prince, on Friday, 11 December. The Little Prince, which will also be screened in 3D at Cine Prestige cinemas, is an animated adaptation of Antoine de Saint-Exupery's beloved novella about a pilot who crash lands in the Sahara Desert and encounters a peculiar young boy who claims to be an extra-terrestrial prince. The sweet-faced, but terribly troublesome Alvin, Simon and Theodore return to the big screen in Alvin and The Chipmunks: The Road Chip. In this film, we see the brothers take an eventful road trip to Miami in an effort to stop Dave from proposing to his girlfriend. The trio set out to save themselves not only from losing Dave, but also from the possibility of gaining a terrible stepbrother. Releasing on Thursday, 24 December, this is one road ‘chip’ that is not to be missed. And just before the holidays end, and to mark the start of an exciting new year, Pixar’s The Good Dinosaur, will burst onto Ster-Kinekor and Cine Prestige screens across the country on Thursday, 31 December. This film takes its viewers on an epic journey into the world of dinosaurs, where an Apatosaurus named Arlo forms an unlikely friendship with a cave boy he names Spot. Choose and be the first one to reach the theatres on the opening weeks of these movies.